When we lived in the city, so many beautiful summer evenings involved a quick walk along leafy streets to our local Thai hole-in-the-wall. Thai iced teas and coffees are special treats that I only allow myself to drink in the summer. After a week of graduation festivities involving traditional American cuisine (hotdogs, hamburgers, coleslaw) and the ensuing leftovers, I needed a meal that was light and different. I also needed a recipe that wouldn’t heat up the kitchen and would go together quickly–because dinner couldn’t run into the Blackhawks Stanley Cup finals game! Cilantro from the container garden. I also wanted to make something with cilantro. 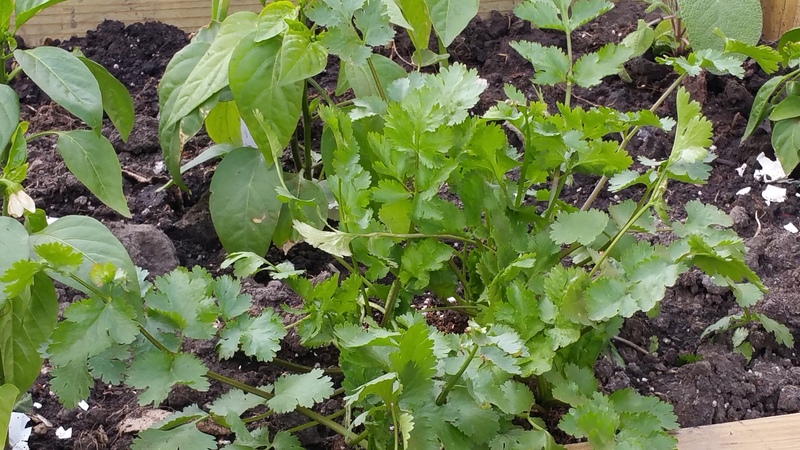 Planted just a week ago, the cilantro in my raised container garden is growing by leaps and bounds. At first, I considered a Mexican dish–but then remembered that Thai food uses cilantro. 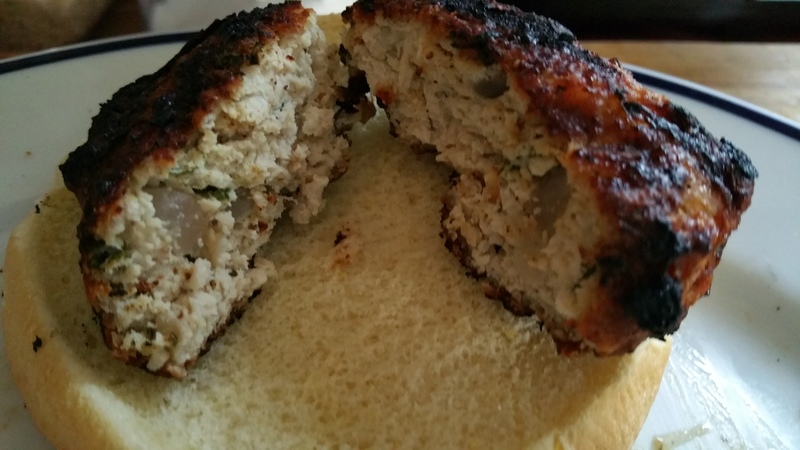 Based on several different recipes, the following is my new favorite burger for the summer of 2015! 2. While your grill is warming up, put the chicken into a large mixing bowl. 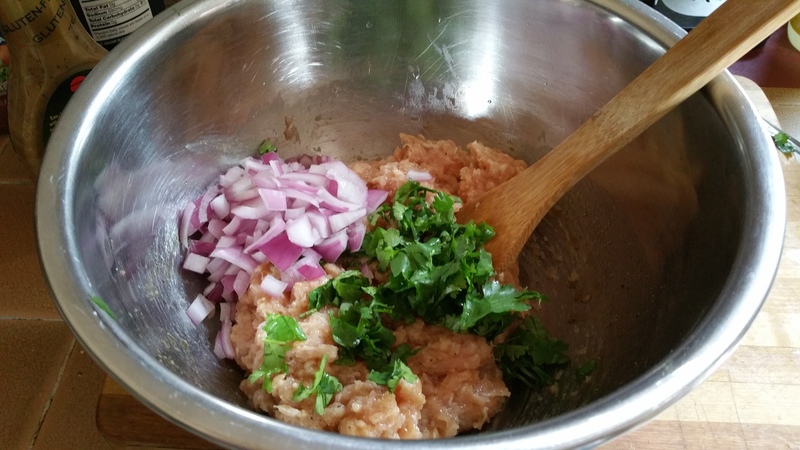 In a second bowl, combine the onion, cilantro, fish sauce, ponzu, ginger, sesame oil, garlic, and black pepper. Mix together. Then, combine the onion and spices mixture with the ground chicken. Stir together with a wood spoon or combine with your hands (use waxed paper because ground chicken is really sticky), until the ingredients are well distributed throughout the chicken. 3. Form into 6 patties. 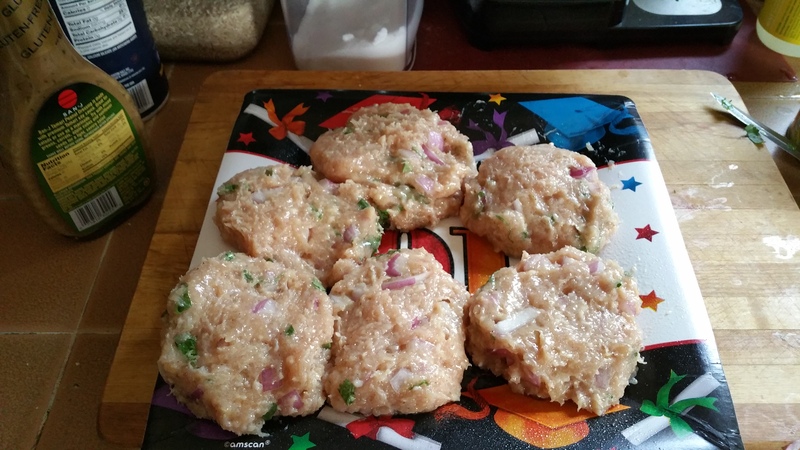 Place patties on a plate. Spray the tops of the patties with Pam–otherwise they will stick to your grill. 4. Grill the patties on med-high heat for 10 min., then flip. Grill for another 10 min. or until done. Make an Asian slaw with pre-shredded cabbage, shredded carrots, and a dash of your favorite store-bought Thai peanut sauce. 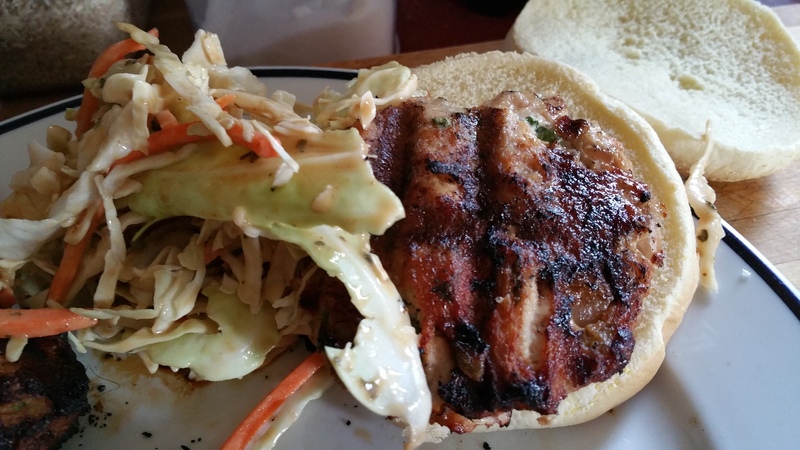 Here’s the finished grilled Summer Thai Chicken Burger. Note the delicious cilantro and red onion. The grill was lit at 6pm, and dinner was served and eaten before the 7pm start to the Hawks game!